This interesting box was painted by a talented Palekh artist Trofimova Olga. 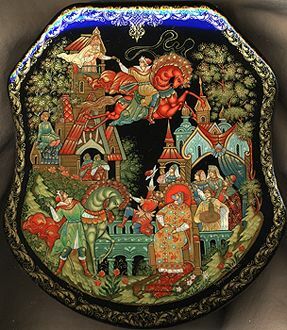 The box shows several scenes from the Russian fairy-tale "Sivka-Burka".In the middle of the composition we can see how Ivan gives a magnificent leap, high up into the air. The reason of it is the tsar's daughter caprice. She sits in the highest balcony of the highest tower in the kingdom and lays down her conditions. Whoever is able to reach the balcony from the ground and can kiss her wonderful lips will be her bridegroom. Having heard this announcement, many young men from all nooks of the kingdom decide to try their luck. Ivan is the only one who manages to fulfill this task. Here he nearly reaches the balcony riding the magical horse Sivka-Burka. The box is made out of paper-mache. Black lacquer covers the exterior and red lacquer covers the interior of the box. A hinge has been fastened to the top of the composition, and the box rests on wavy legs. The work is signed with the artist's name at the bottom of the composition in gold paints.